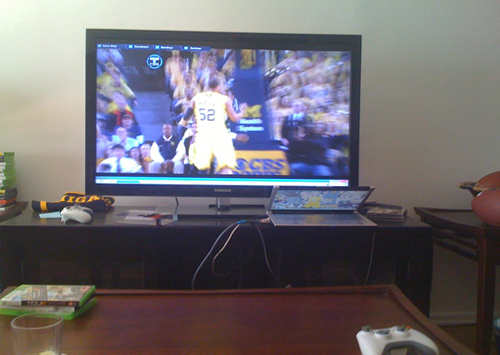 This is how I watched the Michigan/MSU game on Saturday. Despite recently spending far too much money on a flat-screen LCD TV, I live in a geographically undesirable location to watch Michigan sporting events: aside from the fact that my cable provider doesn't have the Big Ten Network, I'm also well outside the footprint of regional coverage. So out of frustration--both from the inability to see games and lack of use of my shiny new toy--I began researching how I could watch the CBS live stream on my TV. As it happens, my aging laptop was well prepared enough to come equipped with an HDMI output. And having a next-gen television, I was outfitted with a couple of HMDI cables. What you see above was the result, with sound only emanating from my minuscule laptop speakers (loud enough to hear but tinny and grating). My girlfriend had been studying for most of the game but came to my apartment with about 5 minutes left in the second half. I commented, "Well, it's not in HD, but this looks good enough that I can enjoy it." Michigan's stat line was pretty typical against MSU: 5-19 from beyond the arc, out-rebounded by 19, and only turned the ball over 6 times in 40 minutes. Despite some recent excellent performances from the three-point line, this is what we've come to expect--and in the future, what we can continue to expect--from this basketball team. Darius Morris is a phenom with the ball and the most improved player year-to-year. Tim Hardaway Jr. is a legit scorer with room to grow and mature. Jordan Morgan has turned into a low-post threat with a bevy of offensive moves. The rest of the team is a bunch of role players that know what they're supposed to do and they generally do so well. This isn't, however, the team of rangy three-pointer sharp shooters we all expected when Beilein came aboard, which was been my biggest concern in the rocky beginning of the Big Ten schedule. In spite of that, Michigan has found a way to compete with almost everyone and beaten a bunch of teams that, had you asked most fans what the results would be before the year, the consensus would've been blow outs. Last year, the team mostly abandoned Beilein's preferred defensive style, the 1-3-1. This year, in spite of mediocre outside shooting, Michigan has found ways to win inside-out, not really resembling the Beilein teams of old. This team isn't HD, but they're good enough to enjoy. Michigan now heads into the Big Ten Tournament ranked fourth in the league after an 8-3 run to end conference play. They're tied with Illinois in the conference as well as overall, and a win over the Illini would almost certainly lock up an NCAA tournament bid. As it stands, Michigan is probably (probably) in anyway with one of those epic "Wait for our name to be called" moments on the horizon. The best news is that the NCAA can't take MSU without also taking us. It feels good to have a win like this over our rivals again.